Phlegm is thick and sticky stuff hanging around in throat, nose, lungs, sinuses, mouth, etc. Mucus membranes produce phlegm to protect the respiratory system. Generally, mucus is so sticky, so it can trap allergens, dust and viruses. When you are healthy, your mucus is thin and when you are sick or have too many particles, you may have thick and more noticeable phlegm. Phlegm is considered as a healthy part of the respiratory system; however, if you feel uncomfortable with it, you can apply some natural ways to loosen it or remove it from the body. To clear phlegm from your nose and throat, there are some natural remedies that are recommended by many experts. 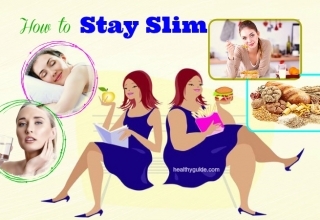 And, in this article, Healthy Guide will give you some of the best ways for phlegm removal. 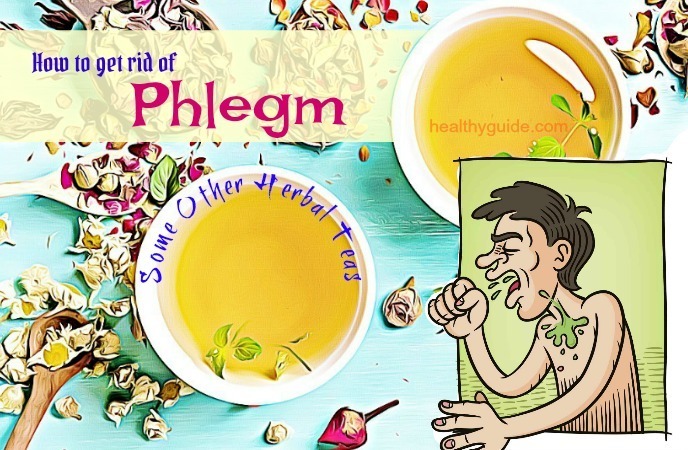 So, if you are having excess phlegm in throat and nose and want to resolve this condition with the help of natural ingredients, you can consider applying any of these remedies at the comfort of your own home. 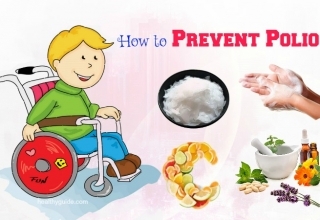 List of 16 Ways On How To Prevent Asthma Attack In Adults will show you some of the best ways that can help you prevent asthma from attacking an adult, so check it out! The phlegm is often expressed through feeling weak, fever, difficulty breathing, a constant cough, and a runny nose. Phlegm contains the bacteria, virus or inflammatory cells. Dealing with phlegm could be never ending. Nonetheless, there are a few home remedies that can help you know how to treat the condition without causing any side effect. If your body produces excess phlegm, which means that your body is trying to battle with illnesses and your immune system is overdriving. In this condition, you need to provide your body with enough water in order to help the body do its job. Drinking enough warm liquids can help to loosen your congestion by aiding the phlegm to move. You can drink anything from juice to chicken soup to clear broths. Besides, other great liquid options include lemon water, decaffeinated tea and fresh fruit juice. Read on Top 17 Health And Nutritional Benefits Of Hibiscus Tea if you want to know some of the best benefits of hibiscus tea for human health. 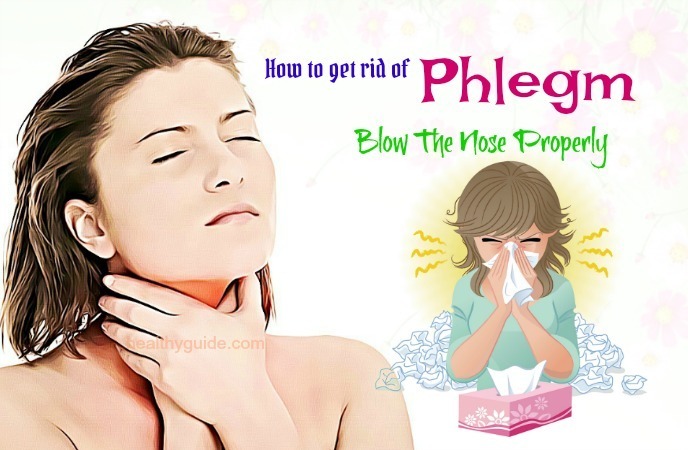 This should be the great way on how to get rid of phlegm in throat and nose that we want to mention in this article and want all of my readers who have excess phlegm to apply for good. 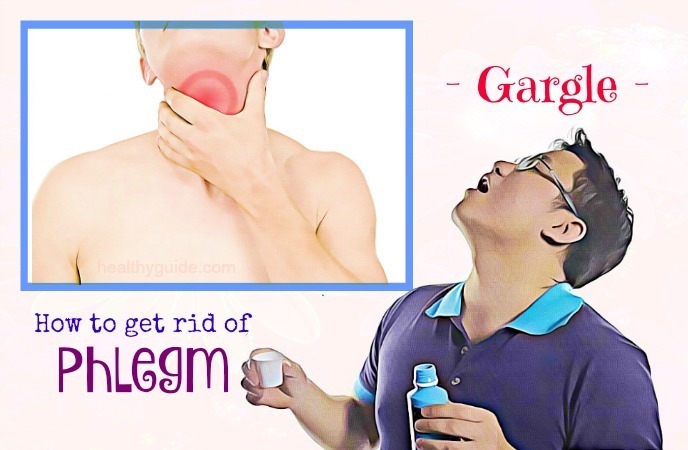 According to a study about best remedies for phlegm removal in throat , gargling can help you remove phlegm from the back of your throat. Even, it can help to kill off germs and relieve sore throat. Mix ½- ¾ tsp. of salt in a cup of warm water. Then, sip a bit of the solution before tilting the head back. Leave it on your throat without swallowing it. Gargle for about 30-60 seconds before spitting out the water. Then, add 4 tbsp. of dried sage to the water. Allow it to cool down for 4 hours and then strain it before using it to gargle. Then, gargle with this solution without swallowing it. Honey contains antiviral, antibacterial and antifungal properties, making it a great home treatment for clearing phlegm and reducing the irritated throat. Moreover, honey contains antiseptic properties, so it can help you improve your immune system in order to beat off infections fast. Mix 1 tbsp. of honey in a glass of lukewarm water to create a solution. Mix 1 tbsp. of honey with some white or black pepper powder together. Consume this remedy twice a day for about 7 days. There is a variety of over-the-counter medicines that you can use to loosen the phlegm. For example, decongestants can help to reduce the mucus flowing from your nose by opening up the airways and reducing swelling in the nose. Although this mucus is not phlegm, it can contribute to chest congestion. Besides, you can try an expectorant, which helps to loosen phlegm in the throat and chest. This OTC medicine often lasts for 12 hours, but you should follow the package instructions for proper usage. Also, there are versions for children aged 4 and older. Moreover, you can try using Chest rubs that contain eucalyptus oil to relieve coughs and loosen mucus. Simply, rub it onto your neck and chest up to 3 times per day. If you are unsure about how to get rid of phlegm in nose, then you can take advantage of using a humidifier. Moisturizing the air can help keep the phlegm in your nose, throat and chest thin. You may know that steam can help to clear congestion. There is not enough evidence to support this method, and even it may cause mild burns. Instead of using steam, you can try using a cool mist humidifier all day long. Just make sure that you change the water daily and follow the package instructions when cleaning the humidifier. Using eucalyptus essential oil can help to loosen the phlegm and then remove it from your chest. Simultaneously, if you are suffering from a nagging cough, this essential oil can help to relieve your cough. To use eucalyptus oil, you can either use a diffuser to inhale vapor or use a balm containing this ingredient. Just remember that you should consult your doctor before letting your children use this essential oil. For healthy respiratory system, you should try to consume foods and drinks containing ginger, lemon and garlic because these foods can help treat coughs, colds and excess phlegm. Addition to this, spicy foods containing capsaicin like chili and cayenne peppers can also help you clear sinuses and phlegm temporarily. According to studies, there are some foods and supplements can help to prevent viral respiratory diseases. They include berries, guava tea, licorice root, Echinacea, ginseng, pomegranate and oral zinc. In most cases, adding these foods and supplements to the diet plan is safe to try. However, if you are taking prescription medication, consult your doctor before adding anything to your diet. Obviously, the simplest way to clear phlegm from your nasal passages is blowing the nose. Nonetheless, you have to ensure that you are doing it properly in order to prevent more problems from occurring. Clear each nostril by blowing gently. If you blow too hard, it can result in some small openings in your sinus areas and even force bacteria and irritants to go further back into your body. To prevent bacteria from spreading, you should use clean tissues and simultaneously wash your hands thoroughly after blowing your nose. At first, have some boiling water in a large bowl. Then, cover your head with a clean towel before leaning over the bowl. After that, breathe in the vapors deeply for 7- 10 minutes. Alternatively, you can take a steamy shower twice per day. To help loosen and remove phlegm from your nose naturally, you can try placing a warm compress on your affected areas. Soak a small towel in some warm water or place a damp towel in the microwave for about 30 seconds. Then, gently place this towel over your nose and cheeks for about 3 minutes before removing the towel. Repeat this procedure 2- 6 times daily until all of the phlegm has cleared. This sounds strange when it comes to learning how to get rid of phlegm after a cold, but it actually does work. By applying pressure to some certain body’s points, the lines of energy will be stimulated, thereby promoting the healing process. A runny or stuffy nose can be caused by the exposure to irritants, so it is very important for you to avoid these irritants, including smoke, dust, smog, molds, pet dander, sudden temperature changes and powerful chemical fumes. There are other great ways on how to get rid of phlegm in nose and throat in this article. So, you should continue to read the rest of this article and then try to apply any of these remedies for good. Another great way on how to get rid of phlegm in throat and nose is using licorice root. Licorice root tea can be used to reduce congestion by loosening and then expelling phlegm from the airways. Besides, it can be used to fight off the viruses causing the mucus overproduction. For treating flu and colds, licorice root can be mixed with ginger or cayenne for better effect. Apple cider vinegar can loosen phlegm, making it be expelled more easily from the body. Besides, according to a study about uses of apple cider vinegar , it also contains antibacterial, anti-inflammatory and anti-fungal properties, which help to speed up the immune system. 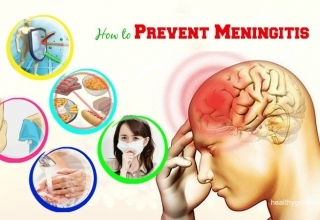 To use apple cider vinegar for thinning phlegm, you can use either of the following methods. Drink it up to 3 times per day. Then, deeply breathe in the steam with your closed eyes. Repeat this remedy twice a day for the best results. Mix 2 tbsp. of apple cider vinegar in a ¼ cup of flax seeds. Then, add 1 tsp. of honey to the mixture for taste. Next, drizzle the mixture over your salad and enjoy. When it comes to learning how to get rid of phlegm in throat, adding spices to your daily diet plan is a great treatment for phlegm removal. 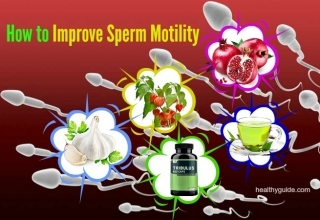 Spices play a vital part in reducing congestion caused due to mucus and phlegm. Many spices contain capsaicin, which is responsible for irritating the mucus membranes, causing the nose to run, thereby removing trapped irritants and mucus from the body. When you have the large amount of phlegm, you should try to stop smoking right away. Smoking can dry out your vocal chords, making your body produce more phlegm in order to make up for the lost moisture. Studies found that there is a relation between phlegm production and smoking. If you are smoking, con can try using nicotine patches while your phlegm dies. Lemon is rich in vitamin C, which is required for the antimicrobial activity. Studies show that vitamin C positively affects the mucus immune parameters. Meanwhile, honey contains antibacterial properties, which help to relieve irritated tissues and swelling. If you want to ease the sticky phlegm, you can try drinking a cup of lemon tea. At first, have a cup of boiling water. Next, add 2 tsp. of honey and 1 tbsp. of brandy and whisky. Mix all of the ingredients and then enjoy the hot lemon tea. Then, drink this solution 2- 3 times a day. Mix all of the ingredients and then use it to gargle your throat. Add 1 tsp. of turmeric to a cup of warm milk. Drink it twice a day, in the morning and at night before going to bed. Add 1/2 a piece of grated ginger, 1 tsp. of Carnation and a few cinnamon to a cup of boiling water. Stir them well, filter and enjoy it. Simply, slice a ½-1/4- inch piece of ginger and then chew it. At first, add ½ inch piece of ginger root to a cup of boiling water. Then, add some honey and fresh lemon juice to the water. Filter and enjoy. Mix grated ginger with some water to create a fine paste. Then, add 2 drops of eucalyptus or thyme essential oil to the paste. After that, apply this paste to your throat area. Leave it on for about 60 minutes or until it makes you feel uncomfortable. Garlic contains powerful antiviral, anti-inflammatory, and antibacterial properties, making it a great treatment for airway inflammation and phlegm removal. Crush a few raw garlic cloves and consume it twice a day, in the morning and at night before going to bed. Then, mix the juice with water in a ratio 1:10. Next, use this solution with a nose dropper. Add a few cloves of garlic to your sauces and soups. If you are looking for natural ways on how to get rid of phlegm in throat, you can consider making use of cayenne pepper. It can help to reduce the mucus buildup in both of your nasal passages and throat and relieve your irritated throat. At first, mix ¼ tsp. each of cayenne pepper and grated fresh ginger, 1 tbsp. each of apple cider vinegar and honey in 2 tbsp. of water. Alternatively, add some cayenne pepper to your daily diet plan. Consuming warm chicken soup is another great way on how to get rid of phlegm in throat. It can help to moisturize your airways and loosen the phlegm naturally. Addition to this, consuming chicken soup can help to relieve your irritated throat. For the best results, you should add some slices of ginger and garlic to your warm chicken soup and then enjoy it 2- 3 times per day. The homemade soup will be more effective in removing phlegm than other canned soup products containing preservatives. Carrot has been found to be effective in eliminating phlegm from your throat. Carrot is rich in vitamin C, which can help to enhance your immune system and fight off a few infections. Addition to this, carrot is loaded with many essential minerals and vitamins that can help you reduce symptoms of phlegm as well. Then, add some water to your carrot juice in order to dilute it. Consume it a few times daily to remove phlegm from your throat fast. 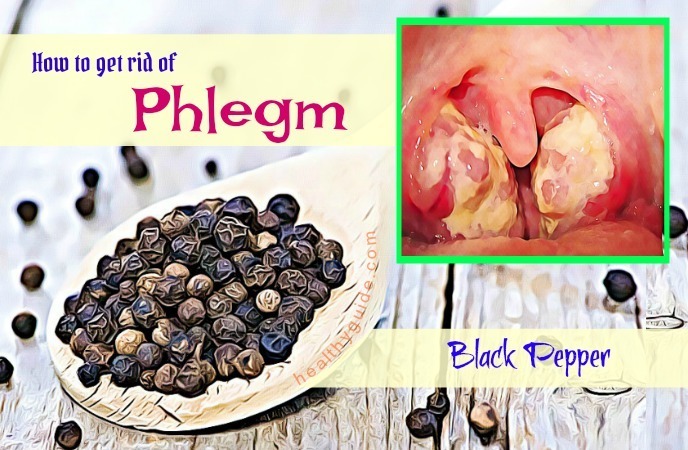 Another natural way on how to get rid of phlegm in throat is using black pepper, which is highly recommended for phlegm removal. Black pepper can help your body break up the phlegm buildup in your nasal passages and throat. Also, the stimulating properties found in pepper can also help you reduce chest pain and irritated throat. At first, cut a lemon into 2 halves, and remove the lemon seeds. Then, sprinkle some salt and black pepper over half a lemon. Finally, consume this solution in order to dry up the phlegm. Mix 1/2 tsp. of ground white pepper with 1 tbsp. of honey. Ten, place this mixture in the microwave for 10- 15 seconds. Use this mixture 3 times per day for about 7 days to remove all of the phlegm you’re your throat. Do you know that mint leaves can be used to get rid of phlegm naturally? You can try boiling some mint leaves in some water for about 10 minutes. Then, you remove it from the heat and bend your face towards the hot water while deeply breathing in over the water. This method can help you open up the sinuses, dehydrate the phlegm, thereby removing the phlegm from the body. 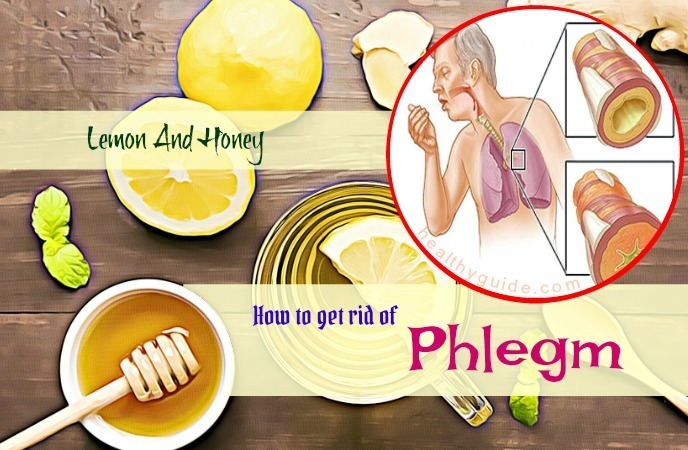 This is another great way on how to get rid of phlegm in throat naturally and effectively that people can consider using at home. Studies found that this herb contains soluble fiber, which helps to reduce swelling and inflammation naturally. Simply, mix 2 tbsp. of powdered slippery elm bark in 2 cups of hot water. Consume it twice a day for removing the phlegm from your body quickly. Also, you can use a poultice made from slippery elm over the chest area in order to help you reduce the phlegm formation. Otherwise, you can take 5ml tincture of slippery elm 3 times daily for better results. Couch grass is very rich in protein, calcium, selenium, fiber, iron, magnesium, as well as vitamins A and B. Working as a great anti-bacterial ingredient, couch grass can help you soothe sore throat and remove the phlegm from your body more easily. To use this herb for phlegm removal, you can boil 2 tbsp. of dried couch grass root in about 2 cups of water for about 5 minutes. After that, strain the liquid before consuming it 2- 3 times per day. Do you want to discover other effective ways on how to get rid of phlegm in lungs, nose and throat? Keep reading this entire article and then try to apply one or more of these as soon as possible. Spikenard root contains powerful diaphoretic, depurative and antiseptic properties, so this root can be used to clear phlegm and mucus effectively. You can try making an herbal tea from the spikenard root and then consume it 2- 3 times daily. Alternatively, you can make use of this tea to gargle daily. Just keep in mind that expecting women should avoid making use of this herb. One of the best treatments for how to get rid of phlegm in lungs, nose and throat that has been recommended by many people is using oregano oil. According to a study about uses of oregano oil for sinus infection , oregano oil contains powerful antimicrobial and anti-inflammatory properties, so it can aid to treat a few respiratory problems, including phlegm removal. Simply, you just need to consume oregano oil or include this oil in your daily diet. Addition to this, you can try taking oregano capsules if you do not have oregano oil available at home. Onion contains powerful anti-inflammatory, antibiotic and expectorant properties, so it can be used to remove phlegm from your body and relax your throat. Addition to this, onion also helps to enhance your immune system and simultaneously boost up the process of healing. To use onion for phlegm removal, you can try making a tonic with sugar and onion. Then, toss the onion with about 2 tbsp. of sugar and leave it on for about 30 minutes. When this mixture becomes a liquid texture, you can use 1 tbsp. of this tonic every 2- 3 hours or when required. Store the rest of the tonic in the fridge for 1- 2 days. Actually, this is also another great way on how to get rid of phlegm in nose, throat, and lungs that you should not look down, yet try to make use of this bark for good. Thyme tea: It helps to boost up the immunity and simultaneously remove phlegm and mucus thanks to its antiseptic properties. Besides, you can also try gargling with the thyme decoction. Aniseed tea: This tea has been found to break up mucus and simultaneously reduce congestion. Simply, you just need to crush some aniseed and soak it in some hot water for about 10- 15 minutes. After that, strain and enjoy it to clear phlegm. Tea tree oil: It contains antiseptic, antimicrobial, and expectorant properties. Thyme oil: It is rich in antiseptic properties and good for treating flu, colds and chills. Peppermint oil: It can help to open up your nasal passages. Rosemary oil: It contains antiseptic properties that help to open up your nasal passages. Basil oil: It contains antiseptic properties that can help you open up your nasal passages. To use these essential oils for phlegm removal, you just need to add any of single oil or a mixture of these oils to the oil burner and then let them waft through your room. Also, you can take a steamy bath added with a few drops of oil, or shake some of the single oil on a clean tissue and then keep it in front of your nose. Before going to sleep, you can also sprinkle a few drops of single oil on your pillow. Lavender oil  is recommended to use because it also helps to bring on a restful sleep. There is a note for you when using essential oils for phlegm removal. It is that you should use 100% pure oils without adulterants and additives. Actually, these home remedies should help you recover within 1-2 days. If they do not work, you should ask your doctor how to get rid of phlegm in nose and throat. Most of the time, excess phlegm is harmless, but occasionally, it may signal that you are getting an infection. Especially, if your phlegm smells bad, looks green or contains blood, it is time to get medical treatment right away. These natural treatments for excess phlegm on nose and throat we mentioned in this article are based on nature 100%, so you can feel secure when applying any of these remedies. 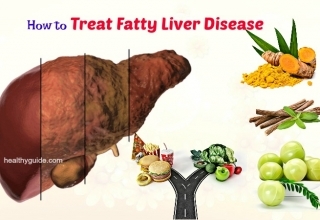 Besides, these remedies can help you resolve this issue without medication, so you will not need to face unwanted side effects and simultaneously save much money. Hope that some of these natural treatments are helpful for your condition. If you know other effective ways on how to get rid of phlegm after a cold in nose and throat, you can feel free to share them with other readers by leaving your comments in the comment section below.